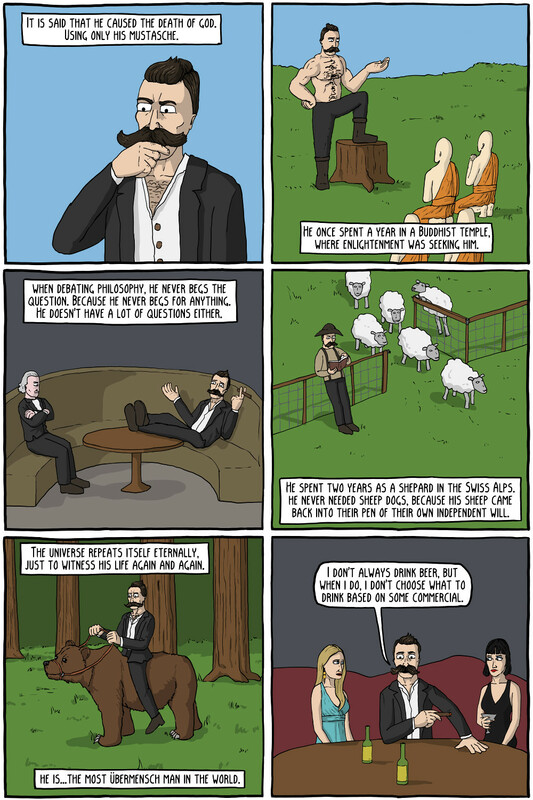 This comic is a mash-up of Nietzsche's ideas of the Ubermensch, and the "Most Interesting Man in the World" advertisements. Of course, Nietzsche's Ubermensch isn't exactly the hyper-masculine ideal that is presented in the ads, but rather someone who is able to "overcome" his humanity and strive towards his own self and goals. The panels refer to things such as Nietzsche's criticisms of Buddhism (that it was a nihilistic philosophy), his ideas of herd morality, and "eternal recurrence". And yes, I'm aware that "most ubermensch man" would translate as "most super man man", but maybe he is just that manly, okay?